I am not shy about promoting other Canadian Etsy Seller's. I love to put them in the spotlight with Feature Friday and my Favourite Things posts. That being said, I also support all artists across the world that promote handmade. I came across Etsy Canada on the creator's blog and was immediately intrigued. What is Etsy Canada? "Created on November 2, 2009, the motivation behind this site was to have it serve as a meeting space for Canadian crafters seeking advice, and inspiration. Although this is not a formal team, Etsy artists can easily find other Etsians locally and nationwide to band together and promote their work. 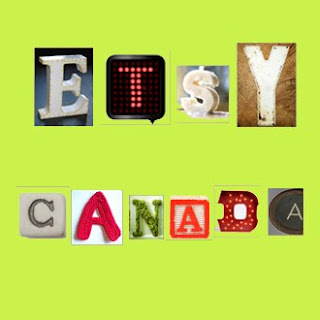 You don't have to be Canadian to join this site as we welcome buyers and friends of Etsy Canada! Promotions will mainly focus on Canadian sellers only, but the blog is for anyone who is a member:)"
If you are looking for a new way to network, are seeking advice, or just want to see who else is out there check out Etsy Canada today!